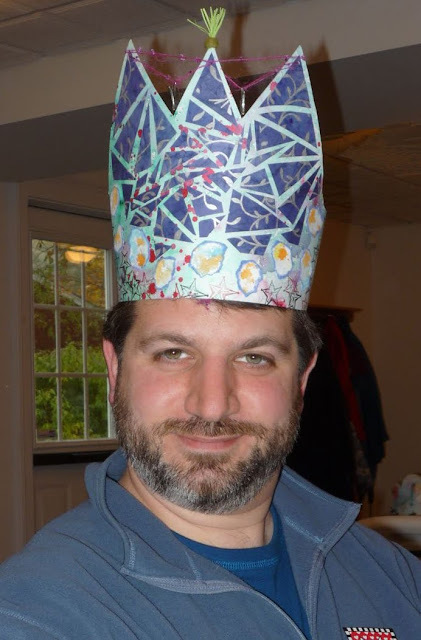 Here's the Bruins crown my dad made. 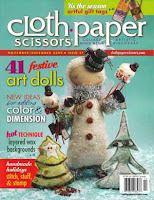 Felt, paper, stamps, charms. Very manly - nice job dad! Who says real men don't craft? 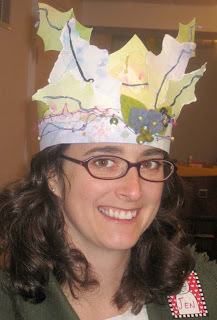 And just in case you need MORE proof... check out the crown Ken made - using the same materials! Very art-y Ken. Nice! 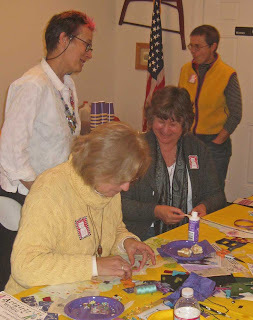 We were so lucky to have an art party on Saturday with Tracy and Sue from Artgirlz in Rhode Island. Artgirlz is (are?) known for their pewter charms and felt beads and things. I personally am in love with making little people using the charms - arms, legs and crowns especially. 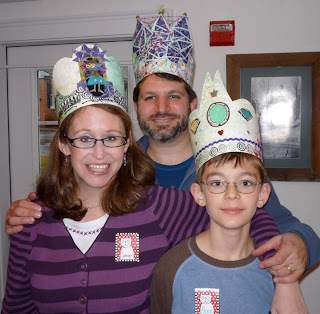 For this event we made big, paper crowns! They started us off with pre-splattered watercolor paper - ingenius really. No blank sheet of paper staring back - we all dove right in - not even waiting for everyone to arrive! 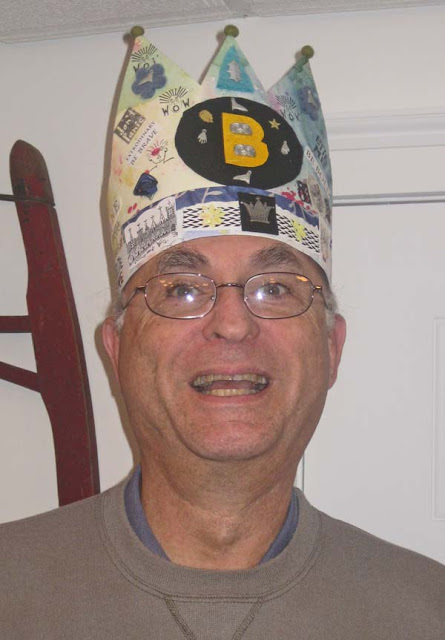 Even my father got into it - he made a Bruins crown - Go Dad! It was absolutely POURING outside - very dismal. But inside we were giddy with gluesticks (and cupcakes!) Which got me thinking that we need more of these silly, fun art parties. Especially in the winter. Cabin fever parties... hmmm.... 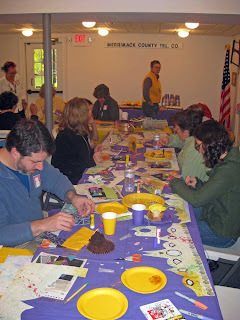 So, if you live within a day's drive of Wingdoodle (Warner, NH) and like to mess around with craft supplies, eat cupcakes, and laugh alot... be sure to stop in at the store, phone, or email (info at wingdoodle dot com) and say "Please, please invite me to the next art party!" 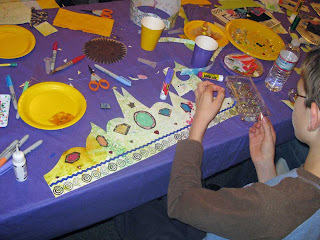 Oh and let us know if you have a great idea for an art party project! I'd love to make some Artgirlz Snowpeople - but I'm up for anything. I have no idea what month I am on... I got back from France and found THREE books waiting for me! Yikes. So - enough whining - here's what I did for the first one. The instructions were to use a basic geometric shape for the string. I used circles and spirals and since I am...ahem... in a bit of a hurry to get these books caught up... I combined all my pages into one Zentangle. Looks sproingy, eh? "When your sole purpose in life is to entertain the gods, there's nothing to do but put on a good show." So, yesterday I was (whining) about how I need an Alice, right? Here's how the universe plays with me... I've been reading this excellent book called "The Red Book" - I'll post more about it later - but I was reading a section about how the universe/god/etc always answers our prayers, always. But we are often too thick, too busy, or just plain afraid to see that it has been answered. Or it is answered in a way we didn't expect. My Irish grandfather always said that his favorite curse was "may all your dreams come true." Which my Jewish Gramma re-phrased as "be careful what you wish for, you may get it." It is very true. I was terrified to have to dance at my wedding. I started dance classes, but also prayed not to have to dance. I had foot surgery and didn't walk for three months. I was on crutches for my wedding. I didn't dance. "That's not what I meant!" I yelled. I think the universe has a great sense of humor. So, after posting yesterday, I started wading through the hundreds of emails I had put off reading while I was in France. One was from Ramit Sethi at I Will Teach You to Be Rich (which is a great website, despite the scammy sounding name. Ramit is a money genius. He has a lot of very practical, sound suggestions.) In Ramit's email he talked about a great new online service that helped organize your shopping lists, find the best prices on your products, find coupons, place your order, and ship it all to you with no shipping charge. Oh, and it reminds you when you need to reorder stuff, and has a community discussion board too. Someone to do all my grocery shopping and offer advice!! Hmmm... guess what it's called? Yes, Art! If you can create Zentangles, you can create art. In this class we will work with Panpastels, stencils, printmaking, colored pencils and Zentangle patterns to make beautiful little treasures. You’ll learn some techniques to make multiples of your tangles that you can share with friends. Never thought you’d be giving your own artwork as GIFTS? Find out how good it feels! (Yes, YOU, really!) Zentangle 101 is required. All materials provided. Zentangle 101 required. What do you get when you combine a Zentangle and a Mandala? A Zendala! (or a “Mantangle”?) 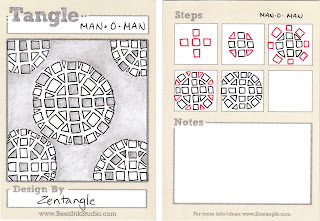 Learn some new patterns and tangle in a circle. Workshops are held at The Belfry studio above Wingdoodle, in Warner. The building is #19 on Main Street, in the center of town. For directions to Warner, please email Sandy at beezink@tds.net or call Wingdoodle at 603-456-3515. Please be aware that the studio is on the second floor and there is no elevator available. 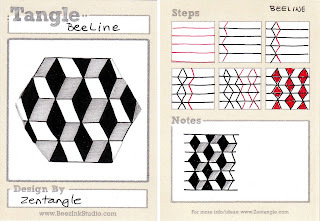 If you would like to arrange a Zentangle class for yourself or your organization, please email Sandy at beezink@tds.net. A minimum of 4 people is required. I woke up thinking about that movie, "Ghost Town" where the dentist, who just wants to be alone, has a near-death experience and can suddenly see ghosts. And they want his help. Kind of like "Sixth Sense" but not as scary. That ability would be a blessing and a curse. Sure, you would have the chance to help put things right for people so they could move-on - and heal some wounds they may have left behind. But you would also never be alone and anything you did for yourself would seem selfish since you could be helping someone else at that moment. What if, instead of seeing dead people, you could see the unborn? You know, people who have not yet come into existence. The Possibilities. I guess that is kind of like the old TV show "Voyagers" where Phineas Bogg (?) and the 12-year old kid travel through time making sure history happens the way it should. One tiny little change, and history spirals out of control. But what if you were responsible for making sure that people were born? Not actually having the baby, but making sure the right people meet and all that. Oh, "Early Edition" was kind of like that too - fixing things that aren't supposed to happen. I think the biggest curse in each of these storylines is that the hero can't "turn it off". There is no way to take a break and just be normal. It is very hard to enjoy the moment, smell the roses, just be... all that. Why am I dreaming about this stuff lately? Yeh, good question. In the past few months I have gone from one amazing adventure to another, met fascinating, creative people, and had many basic truths challenged. I've moved away from my safe wall and dared to open my mouth and talk to people. (Very uncomfortable!) In return, I've heard this comment from alot of people: "You are SO creative! What a blessing to be so talented." Well, I don't know. Yes. I love to be able to create. I am never happier than when my hands are making art. But... how would you feel if you were responsible for every unborn idea? Or every idea, artwork, or possibility that had been realized, but not properly. Things that should be redone. Problems solved. Pain you could fix, maybe. What if one of your ideas could save the world if you could only buckle down and create it. What if every one idea you sketched opened up unlimited numbers of doors and possibilities? What if all these ideas were always present, jostling to be seen and brought into the real world? The inside of my head is like an enormous room filled with television sets of all sizes and types of reception - all showing different channels. In front of the tvs are billions of ping pong balls bouncing and ricocheting off every surface, never quiet. Honestly, it is exhausting, depressing, and delivers anxiety attacks that no amount of Lexapro could quell. I walk into a store and my mind redesigns the layout, the signage, the flyers, the individual products... without my realizing I'm doing it. I can't remember why I am came in. I read a book and I wander around for days worrying about the main character and thinking of ways I can help her. Like Ella in "Ella Enchanted" I am obliged to answer any creative request made in my presence. I honestly dread talking to people who say "Oh I have a great idea! You should...." Thank you. I needed another one. My son and I decided a long time ago that everyone has some kind of super-power. Not all are easy to recognize - the ability to sooth cholicky babies might never be noticed if one is never around babies! But the person who can look into a mostly empty refrigerator and pull together a delicious, healthy, dinner for four... well, THAT is a more useful super power than, say, x-ray vision!! I have two super powers (that I know of). One I discovered when I was very little. I can see a scene from a different perspective. For example, while riding my bike down a steep hill, I could suddenly see myself riding down the hill from the vantage point of my mom standing at the bottom. Not very useful, and a little freaky. But I can also do it for situations. It's kind of like walking in someone else's shoes. It is confusing and uncomfortable. My other super power is, I think, much better, but, like Clark Kent's, one that I usually keep to myself. Recent books and movies like "The Secret" and "What the Bleep?!" have helped me to understand it a little, but my husband, and most people I know! think it is a load of @#$%! I can see ghosts. I see visions of things not yet created. I have done it so many times, I think my husband ignores it (probably because he doesn't understand it). I can look at a house, a room, a business, a canvas... and know what it will look like. I see it so clearly, it might as well already be there. For example: think about a renovation you have done, like your kitchen. You love your new space and as years go by you forget it ever looked different. But one morning you walk into the kitchen and you suddenly remember that the window was over there and the fridge was brown and next to the door, etc. You get a very clear image of the way it was. I do that in reverse. It's almost like (my first super power) I am standing in the future, looking back. It's not a hallucination - it's more like an overlay. This power can be very useful - when I was setting up my store, Wingdoodle, I saw it finished - the playroom, the colors, everything. And that helped me to keep working towards my goal even when people said it would never work. But, sometimes, knowing what the finished product will be, takes away the challenge and the thrill of the unknown. I say, "What's the point?" and file the sketches away. And, if an idea cannot be accomplished (lack of money or emotional support), it doesn't just fade away. It is always "there" reminding me of my failures - just like people-ghosts. Since I am not crazy (yet? ), I am always reading about creativity and spirituality and trying to find ways to control everything or at least ignore some things. And since I know that I cannot control or change those around me... I find that I fantasize about finding an "Alice". The Brady Bunch family is not my ideal, but Alice is. I dream of a motherly type person with a great sense of humor, who would keep my house under control, take care of my kids, feed me dinner, listen to my ideas, give gentle advice, reassure me that I am doing great, and tell me everything will be OK. In honor of our Warner Fall Foliage Festival this past weekend. Striping brings to mind circus tents and country fairs. 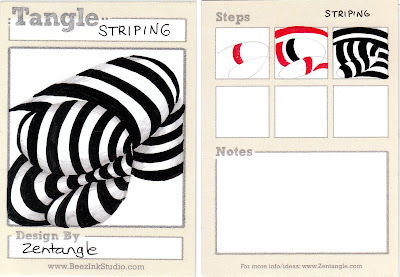 You can draw your stripes in any direction and any thickness. For dimension, try adding a little shading where-ever one set of stripes goes under another set. Last week, I spent a few days down in Whitinsville, MA at the second Zentangle Teacher Certification Workshop. I was invited back to talk about my experiences and show my work. I felt like a rock star! I am usually very quiet and kind of hover on the edges of any event or gathering. But here, I often found myself the center of a group and my throat was sore from talking by the end of each day. It was pretty exciting though! It really is an amazing feeling to think that people actually want to hear what you have to say. Of course, I also learned a lot by listening to other people. Anyone reading this outside my teaching sphere of influence - you'll be happy to know, there are now over 100 CZTs (Certified Zentangle Teachers) around the world!! 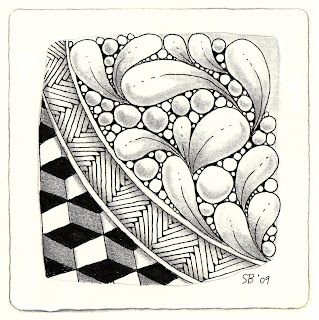 So check www.zentangle.com to see if there is someone near you. It really does make a big difference to learn from a live person! The idea of a Zentangle How-to book came up and I'd love to hear your thoughts on what you'd like to see in it. 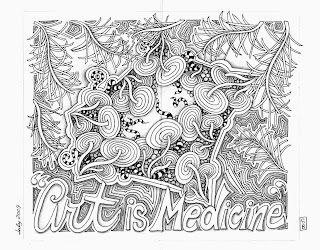 What would the ideal Zentangle book look like to you (and would you buy it?!) I'll put up some patterns that were presented by other members in the group - like an amazing one that looks like chicken wire! For now, here is BeeLine (used in the tile above). This is one of those magical patterns that just jumps off the page as soon as you add the shading. I personally think this one looks more like folded strips of white paper on a black background, rather than just 3-D boxes. It might be fun to try adding a pattern to the strips... hmmm. If you are in the area, and have time, go see this show! 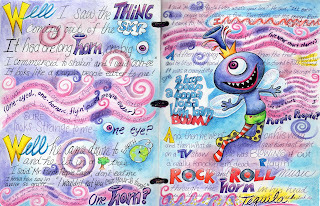 24 artists, in 2 groups of 12, passed around altered books with color themes for one year. 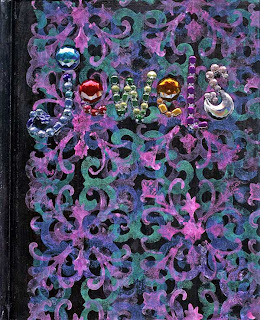 My book had the theme of "Jewels" (as in jewel tone colors - fuchsia, teal, etc). The books are displayed on white chairs. You pick up the book, sit on the chair, and peruse. The altered art is really amazing. This show was up in Bethlehem, NH at the WREN Gallery, last year. A very nice gallery, but a long drive. So if you missed it there, see it here!